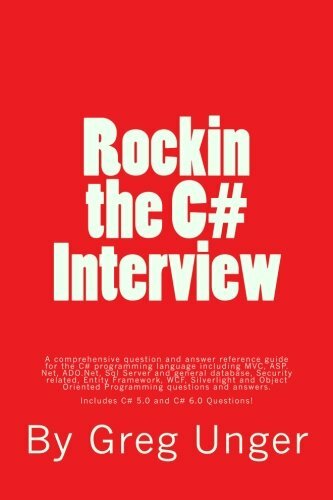 Rockin the C# Interview: A comprehensive question and answer reference guide for the C# programming language. Completed updated for 2017! Never be stuck not knowing the answer to a technical interview question! This book will get you prepared. Never get turned down because you didn't know the answer to a technical question. Even the most advanced C# concepts are in this book. The job market is tough and the competition has never been greater. It's necessary to stay ahead of the game and make sure you go into an interview prepared. You don't have time to waste to get the job of your dreams. 99% of candidates fail because they don't remember specifics. This book will give you the edge you need to put yourself above the rest. Interviewers are looking for people who know their profession inside and out. Here's your chance to shine. You aren't getting the job unless you know what's in this book! Written by one of the leading careers experts and bestselling author of "Rockin Interview Series", this definitive guide to questions and answers encourages every job-hunter to think on their feet and express your individuality while supplying ideal responses to interview questions so you're seen as the ideal candidate for the job. Learn how to negotiate the best rate for any contract or salary and get the most compensation you can. This book tells you the secrets to getting the most money for your time and effort. You're guaranteed to make an additional $5k - $50k more for the exact same job just by following my advice! Bonus questions and answers for MVC, ASP.Net, ADO.Net, Entity Framework, WCF, Silverlight and Object Oriented Programming.